The David Adams Leukaemia Fund has launched their Celebrity Teddy Bear auction at BAFTA Piccadilly yesterday. Celebrities, including Daniel, have collaborated to transform handmade Steiff and Charlie teddy bears into highly collectable, iconic items. Their (online) auction is set up to raise money for the Early Detection Cancer Unit at the Royal Marsden in London. You can now bid at teddy-tea-party.com. It is unknown when the auction will close. Update: 19th November 2018. The auction closes tonight at 10 pm. Update: 23rd November 2018. The bear raised £360. Below you find photos of the signed Daniel Radcliffe Harry Potter bear. 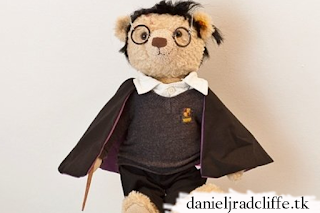 Other Harry Potter teddy bears are Emma Thompson's Trelawney and Imelda Staunton's Umbridge.